The Stephens Road Homestead is a secluded, conveniently located multi-use farm in the Pauline section of Spartanburg County. 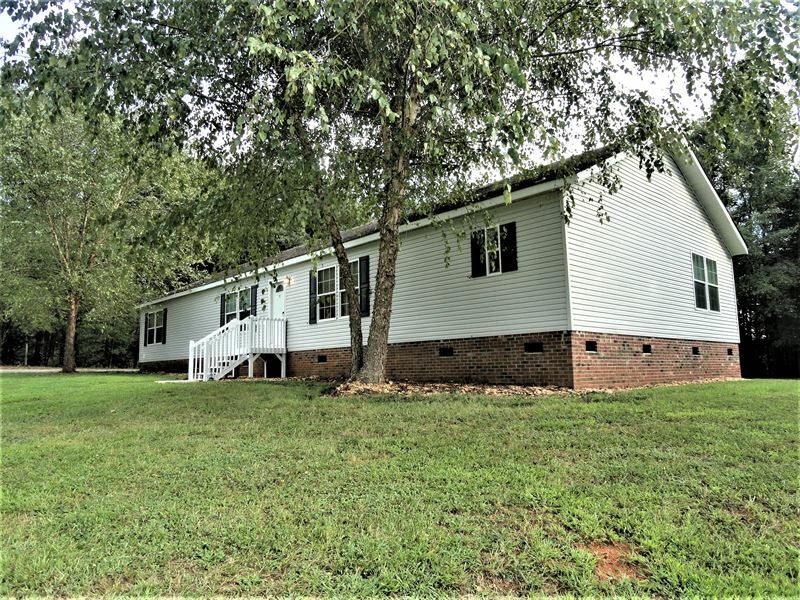 This property is ideal for someone looking to have a quiet home in the country, with the convenience of being close to work, dining and shopping in Spartanburg. The home is a 2004 Clayton Home, 3 BR / 2.5 BA, clean and in very good condition. It has been permanently detitled and sits on a quality brick foundation, so it should approve for low down payment FHA and Conventional loans. At over 2,300 square feet, it very spacious and bright and has an open floor plan. Huge great room, dining room, den and kitchen. The large, private master suite features a private bath with garden jetted tub, separate shower, double vanity and walk-in closet. The 2nd and 3rd bedrooms are both spacious, and share a full bath in the hallway between. The half bath and laundry room are around the corner from the den and guest bedrooms. The home is tucked in the back of over 11 acres of beautiful land. Plenty of room for your family to roam. It is mostly open pasture, with some woodlands, and has a small amount of frontage on Ward's Creek. The land is part of a covenant-protected neighborhood of 5 estate lots intended for residential and agricultural use (no commercial), but there is no HOA or annual fees. Horses, cattle and household pets are permitted. Wildlife is abundant, including whitetail deer and wild turkeys. The Stephens Road Homestead's location is super-convenient, just 20 minutes from downtown Spartanburg, 10 minutes from Dorman High School, and with easy access to Interstate 26. The property is currently zoned for excellent schools in Spartanburg District 6 (Roebuck Elementary, Gable Middle School, Dorman High School). Tyger River Nature Park is just 10 minutes south. An adjacent 10 acres with a large pole barn is also available. See the “Ward's Creek Minifarm” listing or contact listing agent John Stillwell for more information.